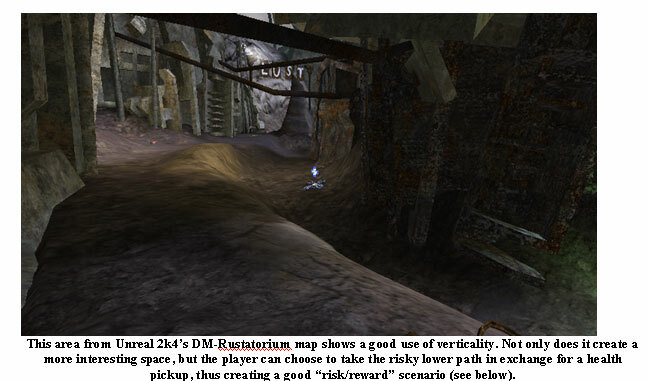 Designing FPS Multiplayer Maps – Part 2 – "On Game Design"
Wow, it’s been a month. Things have been crazy at work lately, but they’re settling down a little now. As a result, I can finally put up the rest of the update I started more than 60 days ago (wow). This was covered a bit in the “cover” section, but it is important to break up long views with cover. Failing to do so reduces the importance of skillful close combat and increases the importance of “fire and forget” splash weapons and long distance sniper weapons. It also makes large open areas less useful as good “risk/reward” areas. The ability for players to choose their own routes, lines, and flows is essential to good multiplayer gameplay. Extreme linearity is a barrier to this and should be avoided except in the case that you want to present a “risk/reward” scenario. Sniping and ambushing people is a lot of fun. However, being on the receiving end of either of these things is not fun at all – especially if you can’t stop it from happening. To that end, sniper and ambush positions should be carefully placed and balanced. Any unassailable position should either be opened up or removed from a good multiplayer map. While secret areas are fun to find in single player, every attempt should be made in a multiplayer game to remove intimate map knowledge as a major determining factor for victory. Secret areas, especially those with very potent powerups or weapons, encourage intimate map knowledge or hiding to the detriment of skillful combat. Does it need to be symmetrical? 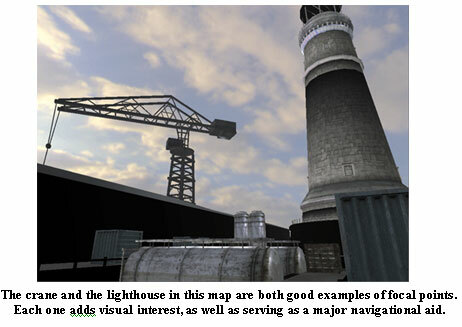 Objective-based modes, such as Capture the Flag, are usually well-served by symmetrical maps. It’s very difficult to balance non-symmetrical objective-based maps, but it’s definitely possible. What kind of level is it? Natural, alien, man-made? Is it a city? What kind of assets will you be using to make it? By establishing this early on, before you do your first maps or blockouts, you can get a head start on what basic shapes you’ll want to use to construct your map. While it’s tempting to jump right into construction or mapping, I’ve seen plenty of maps get ruined because not enough thought went into this part of the process. Does it need to support multiple modes or game sizes? In Resistance: Fall of Man, most of our maps were constructed to take advantage of different player counts and game modes. Because we had to balance these maps for so many different variables, we made a lot of choices to ease in the balance process. That’s why most of the resizable maps were symmetrical, for example. d) has at least 2 (preferably 3) entrances / exits. 1) To serve as navigational aids and landmarks for the area / map. 2) To provide a gameplay and artistic focus for the area / map. 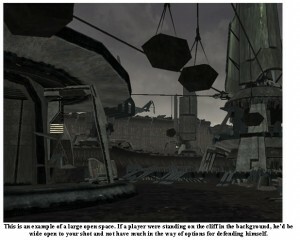 Focal points also tell the players what an area is. “The Lighthouse”, “the base”, “the cave”, or “the docking bay.” Each of these gives you an idea of what it basically is, and what a focal point might be. For example, the docking bay may have a space ship in it that you fight on or around, while the lighthouse is pretty self explanatory. Every map should strive to have one major focal point that the whole map is based around. The focal points must serve to add visual interest and to drive players towards a goal. Pictured above are three examples of simple flow diagrams. Every simple shape represents a different type of area, while the arrows show the flows between them. Keep in mind that these arrows only indicate flow. They don’t necessarily convey any information about number of entrances, exits, or anything else. Now that you’ve got your flow down, it’s time to start roughing out your areas. This can be done on paper or in 3d, as suits the individual designer. When coming up with gameplay for these areas, it’s good to begin considering the other aspects that make up an area. Most important of all, however, is to add verticality. You’ll also want to start thinking about things like view distances, how good you want your various spaces to be for camping, or what (generally) you want the gameplay to be in those areas. A good way to encourage players to make choices is to place a few “Risk / Reward” setups into your areas. These are any time you want to tempt the player into taking a big risk to obtain some big reward. An example would be a powerful weapon in a vulnerable spot (such as on a small beam, or in a large open area, or near a wall). Other times you can tempt a player with an eventual strategic advantage. For example, you could place two paths leading into a base – one has good cover and excellent spots to attack the defenders. The other has a short patch that is open and easily defended, but leads to some good high ground you can use to further demolish your opponents. CTF and Node modes almost require symmetry to achieve balance. Sometimes you will have places in your map that a good player will never go, since it only gives them a disadvantage. Try to avoid this, whenever possible. If you find, through testing the space, that a part of the map is useless space, try creating a risk/reward scenario there. Put a pickup there or create some other reason why it’s a good place to have. Failing that, block the area off to keep newbies from having enough rope to hang themselves. Avoid extreme changes in terrain grade. Not only do they look too steep to walk up, but they are also pretty hard to see when walking towards them. More gentle grades will often be more obvious. When designing corridor style spaces (Pathways, valleys, streets), determine the minimum amount of space needed for the game play you are intending on before designing these area. If possible, strive to use to already built (to-scale) assets when roughing out a 3D space. This can give you a good idea of whether or not a space you designed is going to be big enough once it has been populated with art assets. While knowing a map well is a key to attaining vicory, in general it should not be an incredibly important arbiter of who wins or loses. Skill with the core mechanic fills that role. Secret areas – Secret areas allow flag holders to hide in CTF, and reward map knowledge over skill contests. Powerful hidden pickups – Only people who have played the map will know where to get these. In general, place your most powerful weapons in easily accessible places and use them as focal points. Hard-to-find gimmicks – Things like buttons hidden in the level that call in airstrikes make everyone else explode. These can be cool when they’re in an easily accessible area and provoke a gimmick that you have some countermeasure against, but not when hidden or secret. Tagged Bubble Diagrams, CTF, Determine Flow Connectivity, Determine Requirements, Multiplayer Level, Resistance, Useless Spaces, work. What an awesome read! It’s very interesting to have a true design-insight in level/map design. Great post as always Dodger, I really enjoy reading your blog. Hopefully you can update more often.